Make Alpha Key creates a new alpha channel from one of the existing channels in the image and then applies levels and gamma correction to the new alpha channel. Make Alpha Key also has a PixelChooser that determines which pixels are used to create the alpha channel. You can create many useful effects by making a Full On (completely opaque) alpha channel and using the PixelChooser to control which parts of the image key out. The Alpha Source Layer menu allows you to choose any clip or layer in your composition to use as the source layer. If you choose None, the ﬁltered layer is automatically used as the source. The Alpha From Channel menu speciﬁes the channel in the Alpha Source Layer used to create the output alpha channel. Luminance, Red, Green, and Blue create mattes that become more opaque as the pixels in the source channel become brighter. You can use such a matte to key out shadows in the source image. You might want to try all of the channels to see which produces the best matte for your purposes. The most high-contrast channel is usually the best channel to use. The Alpha setting uses the alpha channel in the source. Use this mode if you are using alpha information from another layer that already has the desired matte. The Full On and Full Off settings create a completely opaque or transparent matte. These settings can be useful when you use the PixelChooser with the ﬁlter. The Inverse settings (Luma Inverse, Red Inverse, Green Inverse, and Blue Inverse) create keys that become more opaque as the source channel becomes darker. The Folded settings (Luma Folded, Red Folded, Green Folded, and Blue Folded) create a “solarized” key that is opaque in the middle of the value range and transparent for the lowest and highest values in the source channel. Here, Alpha From Channel is set to Blue. The ﬁlter keys out portions of the image in which the blue channel value is closest to 0 and keys in the the parts of the image in which the blue channel value is closest to 255. 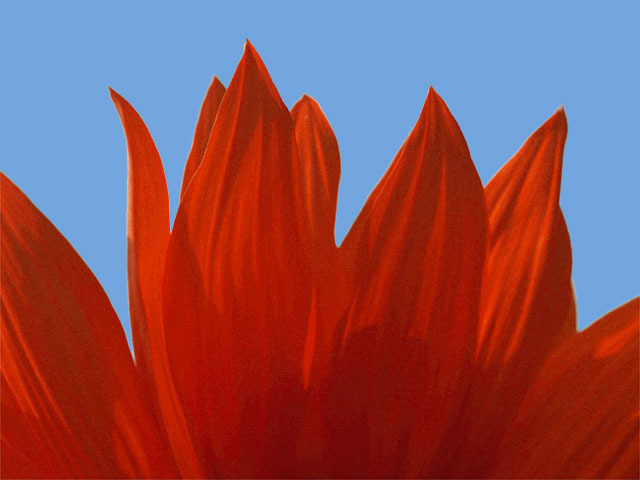 Thus the sky region is left opaque and the ﬂower keys out. Setting Alpha From Channel to Blue Inverse has the opposite effect. 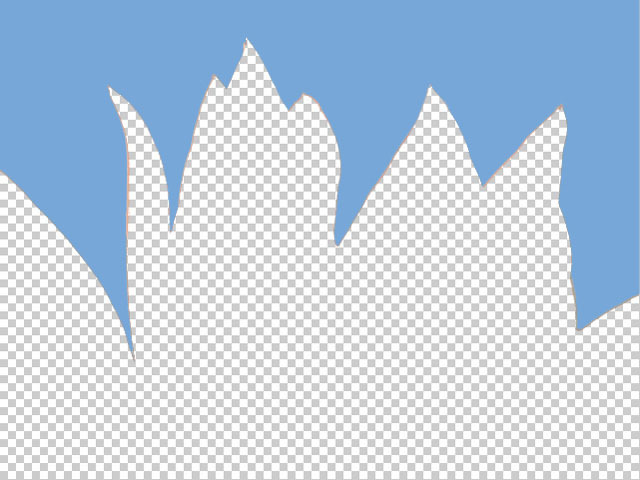 The ﬁlter keys out pixels whose blue channel value is highest and retains the pixels whose blue channel value is lowest. If Alpha From Channel is set to Blue Folded, the middle range of the blue channel becomes opaque and the highest and lowest blue values are both keyed out. This image does not contain many pixels with mid-range blue channels, so using the Blue Folded option makes the image almost entirely transparent. Composite Inv Alpha inverts the new alpha channel. Input Black and Input White determine which values in the alpha channel are treated as purely transparent and purely opaque, respectively. All pixels more transparent than the Input Black level map to the Output Black transparency level, and all pixels more opaque than the Input White level map to the Output White transparency level. Increasing the Input Black value from the default setting of 0 increases the number of semi-transparent pixels that map to purely transparent (pure black in the matte). Decreasing the Input White value from the default setting of 255 increases the number of semi-transparent pixels that map to purely opaque (pure white in the matte). You can increase Input Black to completely key out areas with low alpha values and decrease Input White to completely key in areas with high values. This is an effective way to create a matte that keys out shadows, keys in highlights, and leaves midtones partly transparent. The following examples demonstrate the effect of Input Black and Input White adjustments on a matte. This is the original image. Because the luminance in the sky and ﬂower regions is about the same, it is better to make the alpha from a color channel. In this case, the blue channel provides the most contrast. This is the initial matte made from Blue Inverse. 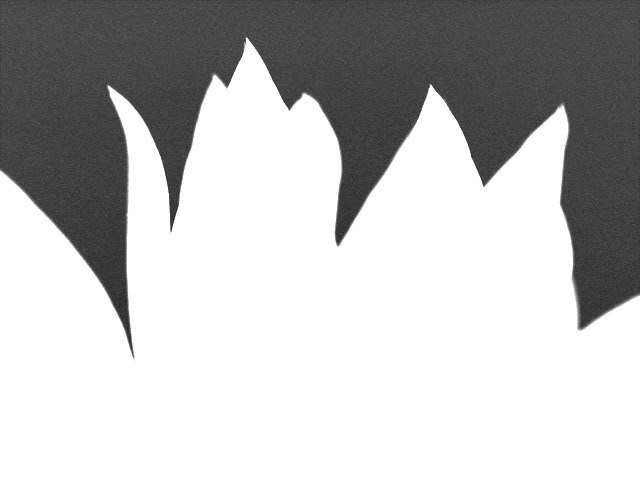 Notice that the ﬂower contains some gray areas that could cause the background image to show through, and the matte, in general, is rather low- contrast. You can remedy these problems using the Input controls. Decreasing Input White eliminates the light gray areas in the opaque part of the matte by increasing the number of gray values that map to white. Increasing the Input Black value increases the number of gray values that map to black, increasing contrast in the matte. The output levels control the range of transparency levels that can appear in the alpha channel. Output Black sets the minimum opacity of the image. Increasing Output Black lightens the black areas of the matte, increasing their opacity. Output White sets the maximum opacity of the channel. Decreasing Output White darkens the white areas of the matte, decreasing their opacity. Post Blur applies a blur to the alpha channel after the key is created. 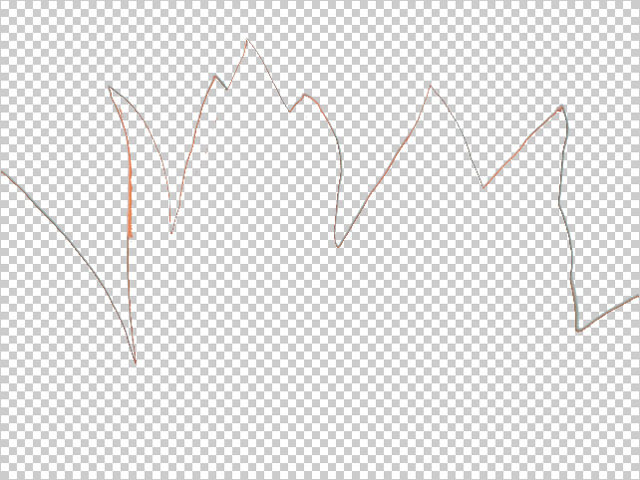 Note that this parameter blurs the entire alpha channel, not just the part created by this ﬁlter. Use Post Blur to soften the edges of the matte for sources with high-contrast edges. However, the PixelChooser in this ﬁlter has one additional control. The Input Alpha menu setting determines how pixels not chosen by the PixelChooser are affected by the ﬁlter. Choose Alpha Off to make them opaque, Alpha On to make them transparent, or Layer Alpha to use the source alpha information for these pixels.